Collect rare Maya artifacts in this addictive, math-based puzzle game that will have you asking yourself: Can I Dig It? 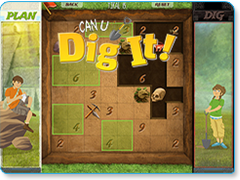 Put your logic skills to the test to excavate artifacts at exotic ancient sites. Have you always wanted to be an archaeologist? Here’s your chance, but be careful: one wrong move and you’ll destroy a priceless artifact! Math, logic and strategy come together in this unique dig-em-up adventure. How many artifacts can you collect? Learn about authentic Maya tools, weapons, jewelry and Maya culture as you work your way through increasingly difficult challenges.